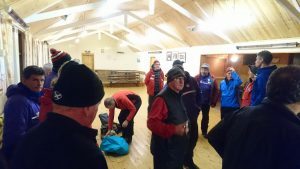 Moffat Mountain Rescue Team was alerted by Police Scotland at 1600 hours that a walker on his way to a remote bothy had become lost and disoriented in the hills above Bentpath, near Langholm. The team deployed over 20 personnel along with a Police Scotland Mountain Rescue team from Glasgow and a Helicopter, Rescue 936, from Caernarfon in Wales. 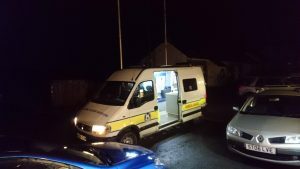 By the time the team reached the search areas it was dark and Police Scotland only had occasional patchy communication with the missing person. The missing person’s car was not at the expected location which opened up the search area considerably. He had managed to locate a remote mast but from the information received it was not clear where this was, but a suspicion was it may have been a remote sensor for the Eskdalemuir Geophysical Observatory site. They were able to confirm a possible disturbance near a sensor but it was not clear if this was human activity. Rescue 936 attempted to fly to the area but was beaten back by heavy snow showers. Team members located the missing person and were able to bring him safely off the hill.